This post was presented to the Carleton University Disability Research Group earlier this year and is cross-posted on their website. Beginning with the recognition of the special needs of disabled schoolchildren in the 1880s, the British state took on the welfare of groups of disabled people perceived to be deserving of statutory welfare. Disabled ex-servicemen and blind people were recognized in legislation both during and after the First World War. The creation of the post-Second-World-War welfare state brought the possibility of new benefits in cash and services for all disabled people, but millions of disabled people were largely excluded, and remained a relatively ignored group throughout the 1950s. With the “rediscovery of poverty” and the liberalization of British society in the 1960s, the welfare of disabled people emerged as an important political and policy issue. This breakthrough in recognition developed into small, targeted legislation in cash benefits in the early 1970s, as well as the landmark 1970 Chronically Sick and Disabled Persons Act. While disabled people appeared to have made great gains with the extensive cash benefits of 1974-1975, these benefits proved ineffective, and appeared just before the rolling back of the state and a renewed focus on non-statutory welfare. Perceptions of the welfare of disabled people changed greatly from 1940s to the 1970s, and while there were psychological and representative gains, policies during the post-Second-World-War welfare state did little to improve their welfare. Thalidomide became available in Britain in 1958 under the name Distival. A sedative used to combat nausea in pregnant women, it was used until 1961 when links were made between its use and limb deformity. The British distributor of the drug, the Distillers Company, withdrew the drug from distribution in December 1961. Approximately 400 children in Britain suffered deformities because of the drug. The tragedy led to procedures in Britain for the examination of new pharmaceuticals, as it did in many of the 46 countries where thalidomide was distributed. The Committee on the Safety of Drugs was established in 1963 to check the safety of new drugs for sale or clinical testing. The parents of thalidomide children fought a long court battle for compensation. In July 1969, Distillers eventually settled the claims by giving known victims £3.25million over 10 years: this equated to about £15,000 for the worst affected. Assessments at the time stated that victims with severe deformities would need at least £100,000 to cover their welfare throughout their lifetimes. 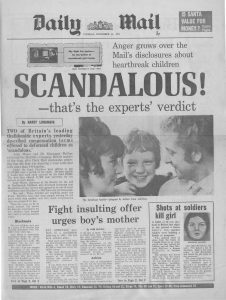 In September 1972, the Sunday Times began to publish a series of articles on compensation for thalidomide children detailing the efforts of Distillers to avoid paying any considerable compensation. While contempt of court laws meant that the media could not attack Distillers’ negligence in distributing the drug, the Sunday Times defied the law under the reasoning that the plight of affected children could be discussed as a moral issue. The articles instigated a massive public campaign to pressure Distillers into providing adequate compensation. Led by Jack Ashley (Britain’s first deaf Member of Parliament) and Barbara Castle (a prominent Labour politician), there were calls for Edward Heath’s conservative government (1970-1974) to step in and provide compensation for thalidomide children. For those studying disability policies and politics in the twentieth-century, the thalidomide crisis is fascinating as the welfare of a small number of disabled children served to highlight the problems of millions of disabled adults. Thalidomide was the first public and welfare-related crisis about disability since disabled people had become a major policy and political issue in the 1960s. By the 1970s, some thalidomide children were reaching adult age and would require some form of lifetime income because of the nature of their debilitating conditions. Many of the issues raised in connection with thalidomide were applicable to those of all disabled people. So, paradoxically, it was the smallness and uniqueness of the thalidomide tragedy that served to highlight the general problems of all disabled people. All involved parties – including advocates, the media, and the Heath government – did not see thalidomide children in isolation, but in the greater picture of the welfare state and disabled people. There was great public pressure for thalidomide children to receive cash benefits for life, raising the possibility of a national disability income for chronic conditions. With the 1946 National Insurance Act and the 1946 Industrial Injuries Act the state took over cash benefits for industrial injury; since 1946, then, compensation for industrial injury was decided by social policy. The shift from the individual culpability of employers or wrongdoers to the needs of the victims was part of the welfare state’s shift from individual to collective welfare. The thalidomide crisis brought up these questions of who was responsible – the offending party or the state – to compensate affected disabled people. And it was further complicated because of the unique situation of a very small number of victims in a welfare state based on shared pooling of risk. You will be aware that many members on both sides of the House have been deeply concerned about these children, and some feel that the government has a measure of responsibility as Thalidomide was prescribed through the National Health Service . . . Ultimately, of course, we need a state insurance system to compensate for personal injury. Until that is established injustice and anomalies are inevitable. I hope your government will formulate plans for a system of this kind. There was a massive public relations campaign in Britain. The government came under great scrutiny in the House of Commons. Posters on the London Underground appeared encouraging the boycott of Distillers’ products. Thalidomide families featured on television and one thalidomide father traveled to the United States and enlisted the help of consumer advocate Ralph Nader. So, how did the Heath government handle the problem? Requests for the Prime Minister and Secretary of State, Keith Joseph, to put pressure on Distillers were dealt with easily as both could say that they were unable to do so as sitting Members of Parliament. Calls for reform of personal injury legislation were deflected in stating it was already under review by a committee on workplace health and safety. The fact that it would be inappropriate for a government, or any of its ministers, to comment on the proceedings of civil litigation conveniently afforded the Prime Minister and Joseph the time to explore possible options for state involvement. So too did pointing out what forms of statutory provision had been made available to disabled people and the victims of thalidomide like the disability attendance allowance or services available under the 1970 Chronically Sick and Disabled Persons Act. Labour Members of Parliament attempted to ensure that Joseph, and Margaret Thatcher, Secretary of State for Education and Science, were exercising their full respective responsibilities in the assisting the welfare of thalidomide children and their families. 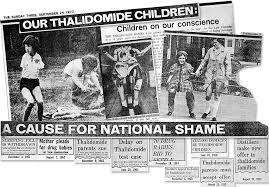 The question of the state providing for the welfare of thalidomide children created a major crisis for the Heath government. The problem was first evaluated within the scope of existing provision. It was determined quickly that the only sort of provision that could be extended to thalidomide children was a one-off cash benefit. In terms of the child welfare, thalidomide children had the same right to services as any disabled child and perhaps even more so as their particular form of disablement might be motivation for welfare personnel on the ground to address their needs. In a similar fashion, all the resources of the National Health Service were available to thalidomide children. Many victims’ families were already receiving the disability attendance allowance. The difficulty with a one-off cash payment for thalidomide children was the political impossibility of confining a special scheme to only 400 disabled people when millions of disabled people wanted more services and cash benefits. There are of course special historical and other reasons for the special treatment of the war and industrially disabled . . . It is sometimes suggested that there should be a single uniform system of payments for accidents no matter how or by whose fault they are caused – in effect an industrial injuries type State-run scheme covering all personal injuries. But it is clear that it would be very difficult to avoid extending the provision of any such scheme to cover disablement resulting from congenital conditions or disease which are by far the greatest cause of disablement. In discussing The Prime Minister’s suggestion of an official inquiry, Joseph pointed out that thalidomide children were in some ways not unique. There were similar cases of amputation, and similar hardship, experienced by many families. With other pressure groups “waiting in wings” as Joseph warned, the financial and legislative commitment would extend inevitably beyond thalidomide children. There was also the concern that some sort of payment or an official inquiry would shift the focus of pressure and the location of responsibility from Distillers to the government. Robin Butler, Private Secretary to the Prime Minister, also pointed out that the Prime Minister’s suggestion of a Royal Commission into compensation for personal injury law would do little to relieve the pressure on government. A solution presented itself in the Lady Hoare Thalidomide Fund, a privately-funded body that was highly regarded by government. The Heath government was able to evade calls for involvement or new statutory provision for thalidomide victims or other disabled people by way of a one-off £3 million donation. The government was quick to establish that this was a unique measure and played down the links between thalidomide and disability in general. While government largely avoided involvement, the thalidomide public campaign succeeded. In 1973, under persistent public pressure and a shareholder revolt, Distillers set up a £20 million fund to provide lifetime income maintenance to the families of victims. Dr Jameel Hampton is the author of Disability and the Welfare State in Britain: Changes in Perception and Policy, 1948-79. He was an Andrew W. Mellon Postdoctoral Fellow at the University of the Witwatersrand and has lectured at Liverpool Hope University and the University of Regina. On March 9, Dr. Hampton spoke about his book at Carleton University. Among the topics discussed was the Sunday Times’ 1972 Thalidomide Campaign and how it affected perceptions of the welfare of millions of disabled people in Britain.